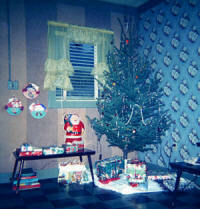 Reminiscing about Christmas at Val&apos;s Motel in North Concord, Vermont, in 1959. 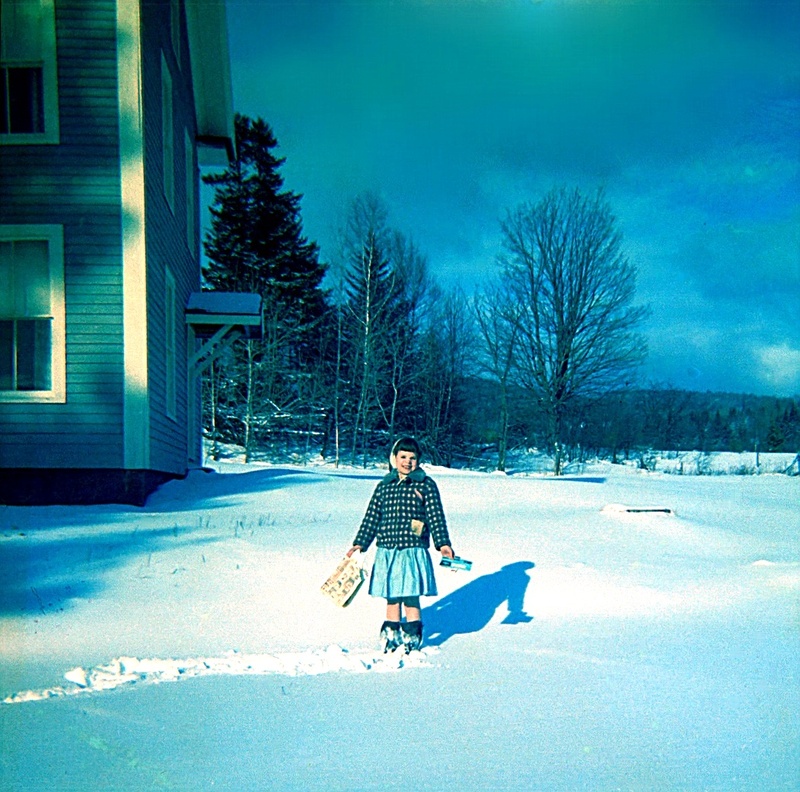 As a widow with three children, with winter of 1959 approaching, my mom decided we could not remain in our isolated house down 20 miles of snow-covered, gravel road with no telephone. And so she found an "efficiency" apartment available for rent at Val's Motel, about 25 miles from the house, but on a paved highway and with modern conveniences like phone and electricity. She arranged for us to spend the winter there, and brought over enough clothes and cooking utensils to tide us over. Once the snow closed in, we would either have to do without anything we forgot, or buy a new one. The family that owned Val's Motel had the last name, "Valentine"; hence, the name of the motel. There was Nana, Mr. and Mrs. Valentine, their three children Mike, Debbie, and Bobby, and a "ward of the state" named Gloria. They lived in the grand old "Big House" a hundred yards or so from two strips of motel rooms. The strip on the right consisted of standard, one-bedroom rooms. The strip on the left was arranged into two-room efficiency apartments, with a kitchen/living room in one, and a bedroom in the other. The Valentines often invited my sisters and me to dinner; and they often showed up for dinner at our apartment. This turned out to be a clash of cultures. The Valentine kids did the inviting; Mom expected such arrangements to be made by adults. More than one evening there'd be a knock on the door, which when opened would reveal little Debbie and Bobby lisping, "My mother thaid I could eat here." Mom, who often planned her no-waste meals down to the spaghetti strand, would have to rearrange dinner to fit on all the required plates—and then, too often, Debby and Bobby wouldn't finish! Mom bought Looney Tunes paper plates and explained that everyone had to keep eating until we could see Bugs Bunny (or Yosemite Sam, or whoever). The reason Debbie and Bobby lisped was that they had no teeth. Not because their baby teeth had fallen out, but because theirs had rotted. The few that remained were blackened stumps. Mike's teeth were perfect, strong and white. At first we thought he just had better genes. But he and I loved to drink milk; Debbie and Bobby preferred to drink Kool-Aid (something not allowed in our house) and they drank it all the time, In fact, we learned, their mother had given it to them in their bottles! We had brought Wrags with us. Each evening I had to "let the dog out" so she could go to the bathroom. We had never made an effort to house-train her, but it didn't seem to be a problem. She knew not to go inside, and there was a big meadow adjacent to the motel in which she could run and poop to her heart's content. Christmas came. Mom decorated a fresh cut tree in the main room. 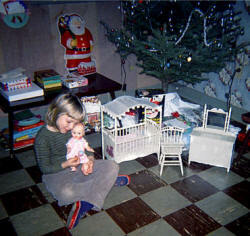 On Christmas morning, Louise had a doll's bedroom set with crib and dresser. 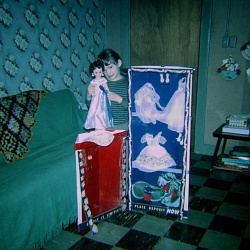 Mary Joan had a 24-inch fashion doll with a wedding dress. We had seen both these toys on display at the supermarket. In fact, the girls had told Mom that's what they wanted for Christmas. But my present was a wonderful surprise. It was an electric phonograph of the type called "high fidelity", or hi-fi. 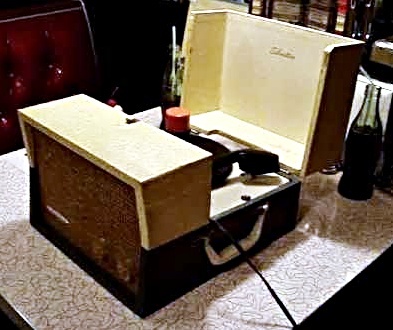 A record changer, it played 78s, 45s and 33s! —Not intermixed, of course; but it could play a mixed combination of 10 and 12-inch records, automatically sensing the size of the record when it was suspended over the platter, then placing the tone arm down in the correct position. One day when we got home from school, Nana Valentine met us with bad news. Mom was in the hospital with pneumonia and would be there a week or more, until she got better. Meanwhile, we would be staying in the Big House because we were too little to stay by ourselves in our apartment. The next morning I went to the apartment to feed Wrags. Upset at the change of routine, and probably terrified at being left alone all night, she had pooped all over the apartment. She also had torn the Venetian blinds and bit into pillows. The damaging was too overwhelming for me, and I felt like it was my fault and so didn't want to tell the Valentines. It also got worse with each passing day, until Mom, barely recovered from her pneumonia, came home from the hospital. We found other accommodations for Wrags the following winter. One day Mom was visiting another apartment dweller, a woman whose husband was in the army. I went along for no particular reason. Mom happened to mention to the lady that she and my sister, Mary Joan, shared a birthday—that is, Mary Joan was born on Mom's birthday. "How interesting!" the woman exclaimed. "My daughter was born on my birthday!" "It's not June 18th, is it?" I piped up. "Oh, Paul, of course not!" my mother scowled. Oddly, her reaction seemed out of proportion to what I'd just said. Especially since the woman was amazed. "But it is!" she said. Nothing seemed to annoy my mom more than when I seemed to know something I shouldn't. 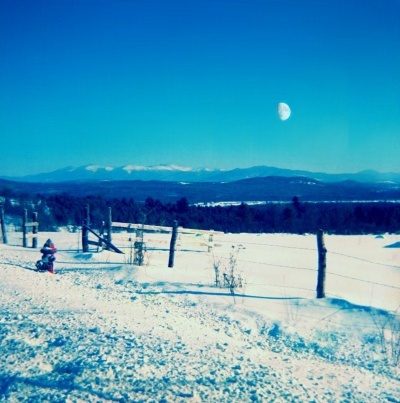 It snowed a lot that winter. A light snow one night when I took Wrags out for her walk quickly became a heavy snow, and then a blizzard as the wind whipped millions of flakes into the air, all lit by a dim street light up near the road. Other than the glow of the light, I could see nothing. I should probably have been frightened, but instead it just looked magical and I could have stood in it for hours. Soon, though, Wrags was begging to go back and I followed her to the apartment door. In school, Mrs. Howe showed us how to make butter. We never had butter at home; Mom was a fervent believer in Better Living Through Chemistry and served margarine. But we were instructed to bring a pint of heavy cream to school. Mrs. Howe then supplied us each with a jar and lid. We poured the cream into our jars, added a pinch of salt, screwed the lid on tight, and then shook! When we were done, we used small wooden paddles to squeeze the excess liquid ("whey") out of our butter. Then, the test: A little bit smeared on a saltine. Oh. My. God. It was delicious! Better than any margarine, and actually better than store-bought butter, as purchased since and if my memory isn't exaggerating. When it was time to go home, our remaining butter was wrapped in aluminum foil; the low outside temperature would keep it safe. Unfortunately, by the time the bus dropped me off, I'd forgotten about the butter in my pocket. Mom draped our coats over the radiator, as she always did. Soon, the rising steam carried the sweet buttery smell, and the butter itself saturated my pockets and melted down the radiator and onto the floor. Mom was upset that she would have to dry clean the coats. I was upset that I wouldn't be able to eat the rest of that wonderful butter. When April came around, Mom didn't try to drive back to the house until people said the road was clear. We then packed, piled back into the car, and returned home. The place was just as we'd left it, still covered with snow. But it was good to be home.